Admittedly I look at packaging differently, but when I write about packaging that I feel stands out on shelf or that shows innovative packaging solutions, I frequently say to myself, “this team did it right”. 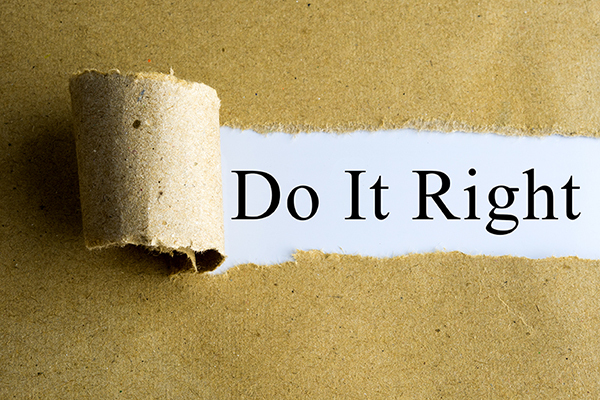 So what does “doing it right” mean? I am sure there are a number of opinions on the topic, but to me, it boils down to these basic principles. Purpose: At its core, the function of packaging is to contain and convey a product, and creating the right structure for a container is both an art and a science. Should the container be round, square, transparent, opaque or a combination of both? Should it be waterproof, freezer proof or tamper proof? Should it have barrier protection or be environmentally friendly? What degree of protection needs to be applied to fragile, perishable or hazardous content? You need to consider the nature of your product, and the impact of regulation, shipment, storage or display. In short, you must always consider how the package size and structure aligns with the end use of the product, consumer behaviors, whether it conveys the appropriate tactile and emotional response with the consumer, and the environmental impact of the packaging you create. Environment: When you resolve the structure of a container, you must understand where your product lives at its destination. Is it on a shelf, in a freezer case, bin or cooler, or in an area where temperature and moisture are factors? Is the product sold in a warehouse, retail or convenience store environment? Is it sold directly through distribution channels to end-users? Is this a product that will be openly displayed in a decorative manner after purchase or will it be relegated to storage in the garage, a utility closet or below the bathroom sink? The physical environment that a product lives in also heavily influences the type of packaging material and the appropriate presses or print materials utilized. The environment also determines the types of coatings that may be required as well as the impact converting issues have on how the final package functions. Having this information can save significant time and money in the design development process, and ensures the packaging concepts can be accurately and efficiently reproduced. Visual Design: With your structural options in hand and awareness of production limitations that influence the process, you can begin the development of visual design. Research and review of competitive products, their messaging, visuals and color palettes will help guide your decision-making as you create the desired level of design differentiation. Familiarity with brand standards or systems should drive the use or modifications of your brand across a wide variety of package sizes and formats. Make sure you understand at the start of the process what you want your visual design system to communicate – is it new, traditional, experimental, innovative, safe, expensive or organic? What are the colors open for use? Seasonal, cultural, trend or production considerations might influence or restrict the color palette you work with, and it is helpful for your design team to be aware of this at the start of the process. Remember, color has the same power to communicate and influence as words or images. Visual Real Estate: Consider the amount of shelf space you have access to as measured by the area of your package that is visible to the consumer. If you do nothing in terms of advertising or marketing support, this space alone must attract and drive the consumer to select your product. The tried and true “5 in 5” rule still applies – within 5 feet of the shelf, you have 5 seconds to grasp consumer interest before they scan to the next product. Do you have one stand-alone product or do you have many styles of the same product? Does your product look different from the product next to it? Is your product on the top or bottom shelf where it is harder to see, or is it at eye level? Does it appear in multiple locations within a given store? Is your product free-standing on a shelf or does it come in pre-packed display units? Regardless of where or how your product is placed in the store, you need to maximize the display capacity of your package. 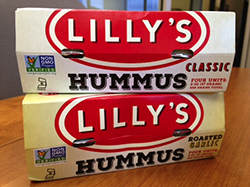 Lilly’s Hummus is a great example of these principles. 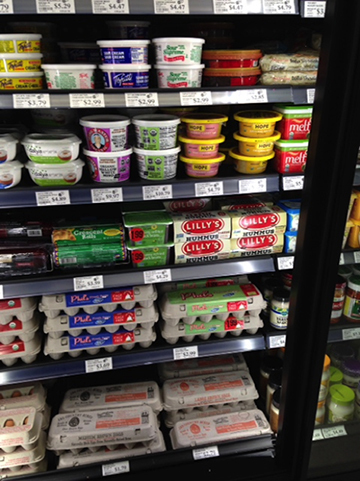 Lilly’s is a new product in the organic foods refrigerator case and immediately stands out as a solid combination of structure and design, reflecting the simplicity of the product content. Nested against a warm background color evocative of the hummus inside, the designers used a simple red hot spot that acts as a target to isolate and emphasize the brand. You may think the package could be called plain, but if it is, it has been done purposely. This package is notable because the design is simple, clean and direct, delivering an all-natural, handcrafted, non-GMO, Kosher verified food product in two flavor varieties and tailored to a variety of consumer uses. The graphics are well balanced, using simple classic fonts, making the text bold and legible. Three of the primary display panels reflect consistent branding and messa ging; with a bottom panel that contains nothing but relevant content and legal information. The primary color palette is dynamic on the package, on the shelf and in the fridge. There is nothing extraneous or excess about this package, and yet it is impactful in its simplicity, and a thoughtful team that embraced the above principles could only have accomplished it. End result – in my opinion, the team behind this package did it the right way. Looking for help in getting it right with your packaging? Want to make sure your brand stands out to consumers? Learn more about our consumer packaging expertise.